As December turns to January, snow and freezing temperatures begin to move in across the country and there’s simply no avoiding it—winter is here. This time of year is marked by shorter days with limited sunlight and chilly weather, which means it can be tough to motivate yourself to move around, let alone get to a gym and workout. You might not feel like running around your neighborhood or biking the hills you normally conquer in summer, but there are alternatives to keep you in shape. We consulted Coaching Lead Glennis Coursey at MyFitnessPal, the health and fitness app with more than 75 million users, to get the scoop on winter exercise and some of the ways she gets her clients in shape when it’s cold outside. Soak up the sun when you can. The toughest part about winter is the lack of light, since it's dark in the morning and at night, try to fit in a walk at lunch breaks. My clients in Minnesota would bundle up and get outside even for just 10 minutes, which makes a difference. That makes getting active on weekends more important because you can get time in the day. Get moving inside. There are more options for getting active indoors than just a treadmill. Malls are a great place to go walking indoors, and often schools will open up hallways, so see if that's available in your area. Get a warm treat. When you're walking, bring a warm beverage with you, or walk to a coffee shop where you can buy one. Just don't forget to choose a lower calorie option (tea vs. mocha). Sweat in your living room. There are tons of awesome fitness DVDs and apps you can build into your routine, I like Sworkit, Nike Training Club and Yoga Studio. I also love the 7 minute workout—there are tons of apps and guides for this. It's easy to talk yourself into seven minutes and hard to talk yourself out of it. It's the perfect commercial break workout. Stand up. A standing desk means you burn twice as many calories during the day, which is especially important in the winter, since you won't be moving as often. Find a buddy. Thanks to the internet, our buddy doesn't even have to be nearby. Having a buddy increases accountability and a little friendly competition can help you with your goals—if you're in Minnesota, for example, it feels good to get more steps in than your friend who lives in California. It doesn't just feel good, either—it can impact results. At MyFitnessPal, our data shows that people with friends on the app lose twice as much weight. 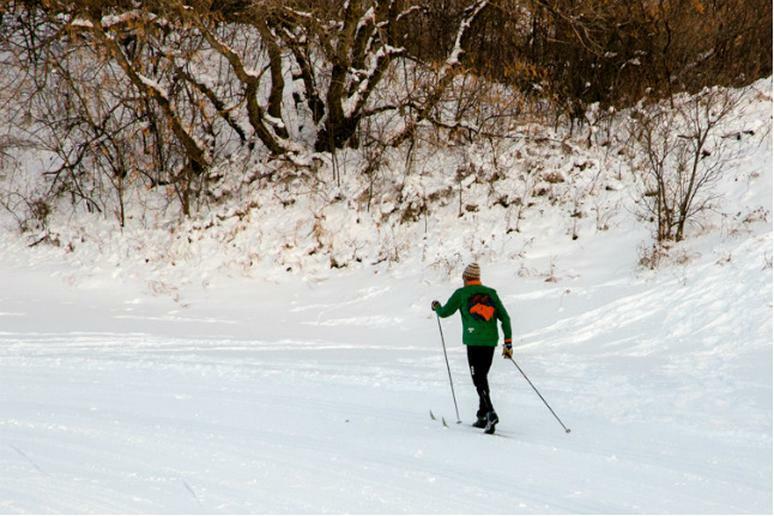 Winter activities burn big calories. Not only is shoveling snow or scraping ice off your car necessary, but those activities also burn tons of calories. Shoveling Snow can burn 500 calories per hour, while scraping ice off your car can burn 250 calories per hour. Coursey writes for the MyFitnessPal blog and you can find her on Twitter.